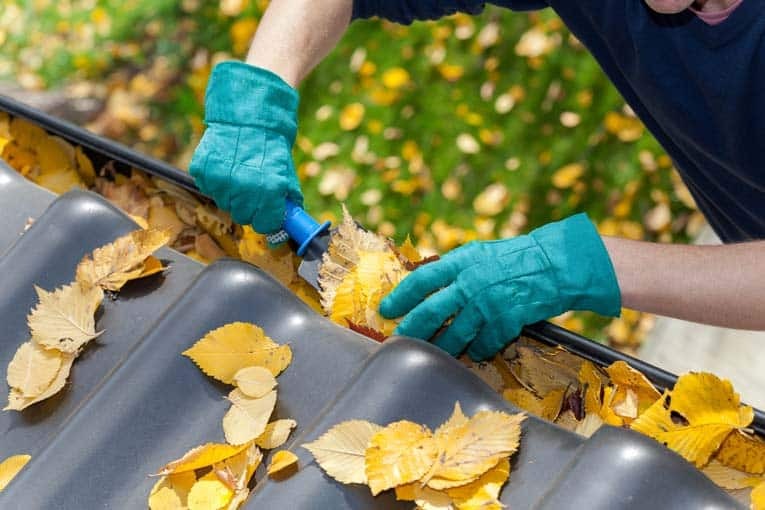 Expert advice on how to repair a skylight, including help with leaks and condensation problems. 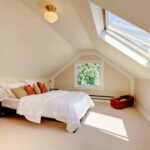 Because skylights interrupt and penetrate the surface of a roof, they are particularly prone to leaking. Rainwater flows down the roof, collects at the top of the skylight, builds up, and eventually finds a place around the edges where it can come dribbling inside. Skylights are typically manufactured with their own integral metal flashing—a flat metal flange that extends from the body of the skylight and tucks underneath the roof shingles. 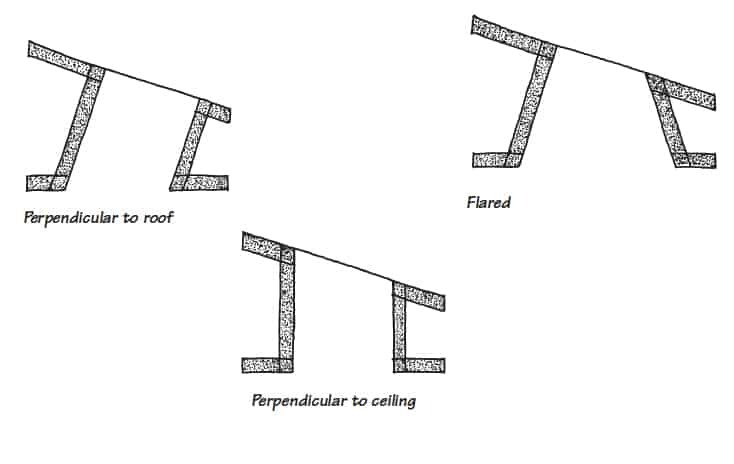 In some cases, a skylight is set up on a curb that is flashed with continuous flashing along the base, step flashing up the sides, and saddle flashing across the top, similar to the way a chimney is flashed. This is described in greater detail below. Before you crawl into the attic to find the source of the leak, consider the possibility of condensation. If you have a roof leak that appears to be at the skylight, the first thing to do is rule out condensation as the source. A skylight in a humid room, such as a bathroom, can drip moisture—it appears to be a leak, but it isn’t. When the warm, moist room air reaches the cold glazing of the skylight, it condenses, and drips down. The way to solve this is to reduce the humidity in the room. For more about this, improve the ventilation or check into a dehumidifier. A skylight is like a window in the roof, but its frame is designed and flashed to withstand the rigors of rainfall that a roof receives. As shown at right, a skylight’s flashing works in concert with the roofing material to usher away rain and snow. 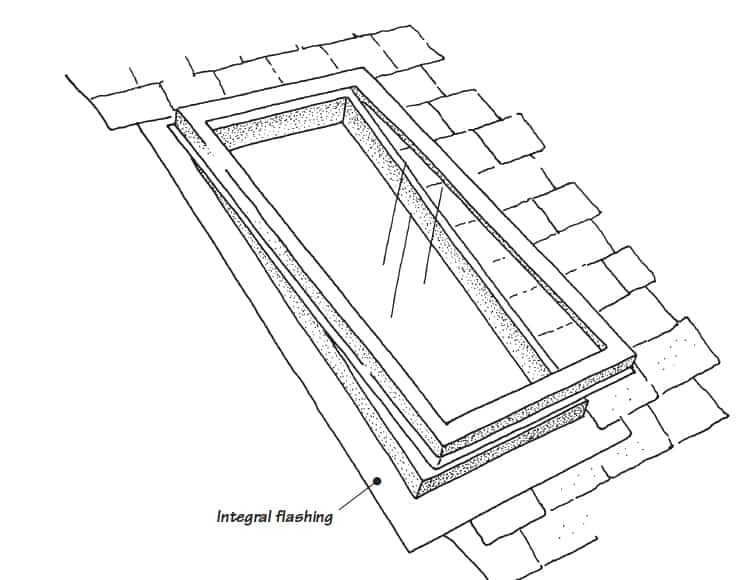 Integral flashing is built onto the perimeter of some skylights. Though some frames are solid wood or aluminum, most new skylights are made of a combination of metal, vinyl, and wood. The exterior frames tend to be aluminum cladding with a durable finish—the part you see inside is often made of solid wood, plywood, or white vinyl. Newer skylights are virtually leak-free thanks to rugged construction and easy-to-install, integral flashing. They’re also equipped with channels that carry away condensation. 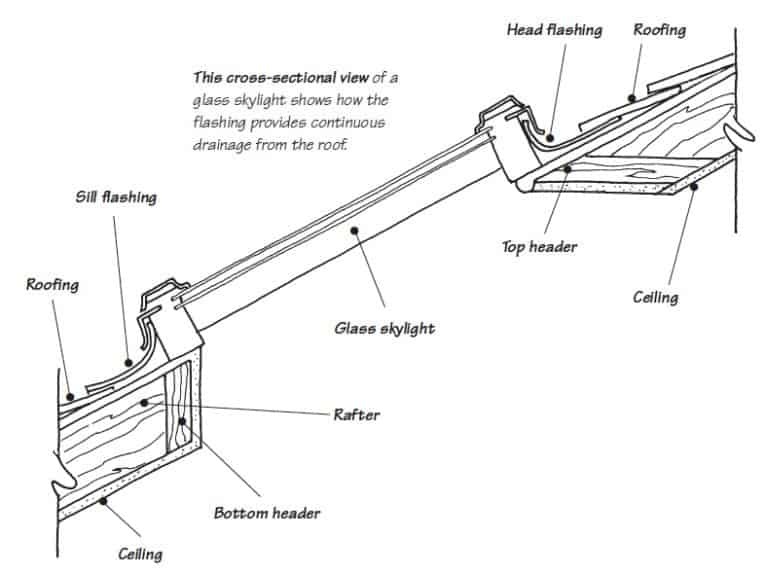 The cross-section view of a glass skylight shows key parts and how the flashing provides continuous drainage down the roof. A skylight’s shaft (see below) governs how light is delivered to the room below. If all four sides are flared, light spreads over a wide area. A shaft with perpendicular sides focuses the light straight below. If the shaft is flared on only one or two sides, it sprays more light in the flared direction. If your skylight leaks, chances are good that the problem is the seal between the flashing and the roof. Identifying where the leak is originating is the first step. 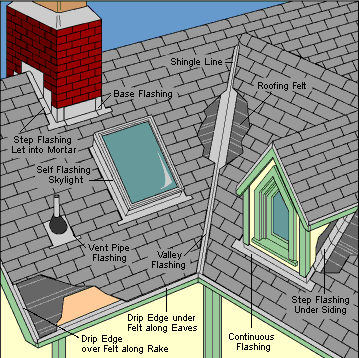 For more about troubleshooting a roof leak, please see How to Find & Fix a Roof Leak. 1 Lift up the shingles next to the skylight one at a time and brush out any dirt and debris. 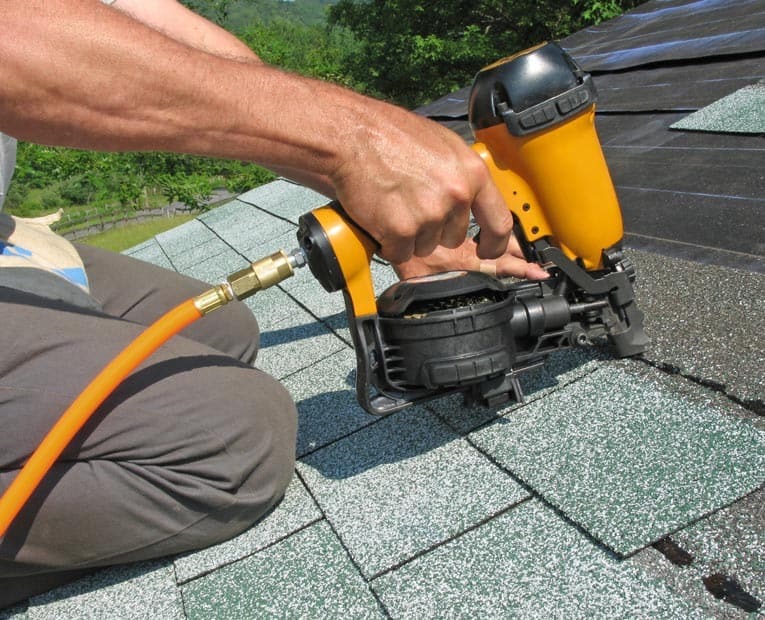 2 Using a caulking gun loaded with a tube of roofing cement, force the mastic up under the shingle where the metal flashing meets the roofing felt (the thick black paper under the roofing material). Then press down on the roofing shingles to seal them tight. 3 Seal any obvious holes, open seams or joints in the flashing, too. For this, you can use the same roofing cement. Do NOT seal weep holes in the skylight frame that are designed to carry away water. 4 Also check the seal where the skylight’s glass meets the frame. If you see any signs of leaking, seal this with clear silicone caulk.